Kenyan TV stations have been shut down by authorities to prevent live coverage of a swearing-in event by opposition leader Raila Odinga, who boycotted last year’s disputed presidential election. Raila Odinga declared himself the “people’s president” in front of thousands of his supporters in the capital, Nairobi. The result of the last August election was annulled following allegations of irregularities. Uhuru Kenyatta won a re-run in October, but Raila Odinga did not take part. President Uhuru Kenyatta was sworn in for a second term in November 2017. He warned the media not to cover the January 30 event and the attorney general said holding such a ceremony amounted to treason. However, the main TV stations streamed the event on their websites and on YouTube and Facebook. Holding a bible in his right hand at a park in Nairobi, Raila Odinga declared that he was answering to a “high[er] calling to assume the office of the people’s president of the Republic of Kenya”. People had had enough of election rigging and the event was a step towards establishing a proper democracy in the East African state, he told a cheering crowd. Raila Odinga’s deputy, Kalonzo Musyoka was not as the event. Raila Odinga said he would be sworn in at a later date. 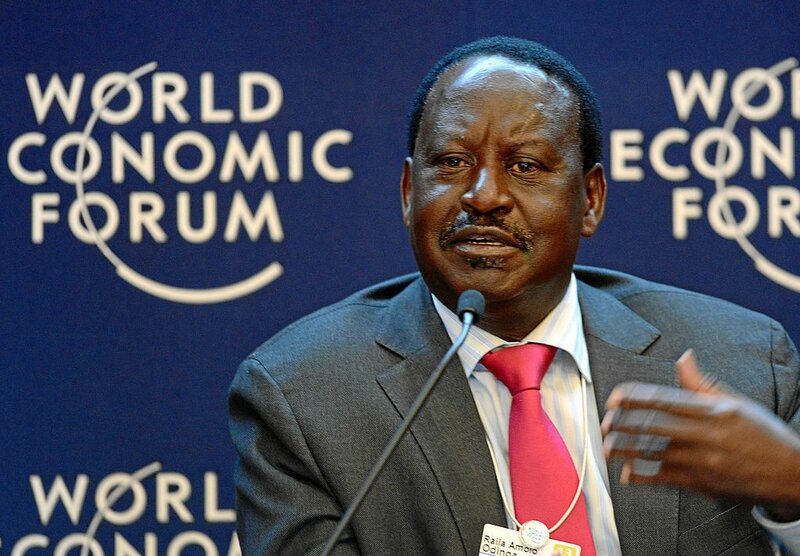 Speaking earlier to Kenyan broadcaster KTN, Raila Odinga said the media ban “confirms we have descended to the level of Uganda”, which stopped media coverage during elections in 2016. He said that his “swearing-in” was intended to “show the world that what we are doing is legal, constitutional and not something you can remotely describe as a coup”. Kenyan journalists have denounced the move as outrageous, in a statement calling for “respect of the constitution” and an end to the “unprecedented intimidation of journalists”. 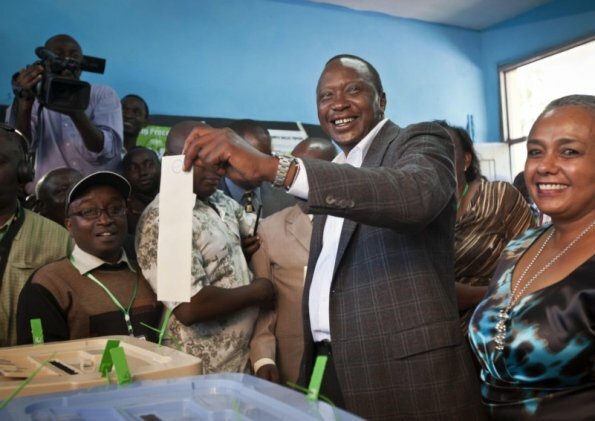 Uhuru Kenyatta was officially re-elected with 98% of the vote on October 26 but just under 39% of voters turned out. He was inaugurated in November. His victory is not recognized by Raila Odinga, who argues he was elected by a small section of the country. 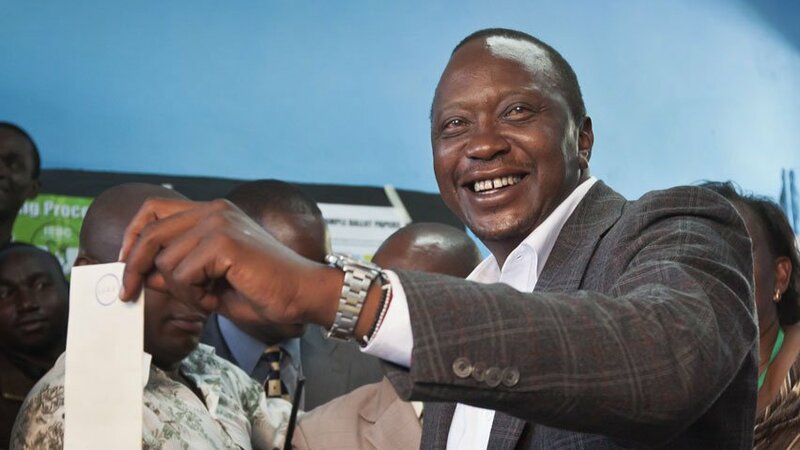 Uhuru Kenyatta also won the original election on August 8, but that result was annulled by the Supreme Court, which described it as “neither transparent nor verifiable”. When the repeat vote was called, Raila Odinga urged his supporters to shun it because he said no reforms had been made to the electoral commission. 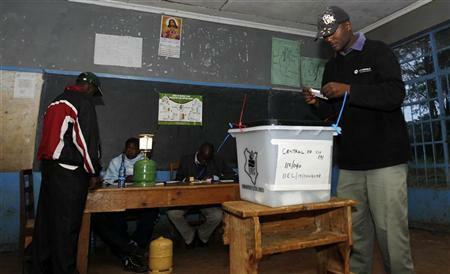 Correspondents say the election dispute has left Kenya deeply divided. About 50 people are reported to have been killed in violence since the August ballot. Kenyan voters go to polls amid tight security in a re-run of the presidential election, which is being boycotted by the main opposition. Riot police have clashed with opposition supporters, some of whom have been blocking access to polling stations. Uhuru Kenyatta is seeking a second term while opposition leader Raila Odinga has pulled out of the contest. On October 26, the polls opened at 06:00 with tens of thousands of police and other security staff deployed to protect voters and polling stations. According to unconfirmed reports, police have fired live rounds into the air to disperse opposition supporters in the western city of Kisumu and the Kibera area of Nairobi. Tear gas has also been used. After casting his vote in the town of Gatundu, Uhuru Kenyatta urged people to cast their ballots so the country could move on. Uhuru Kenyatta also said most of Kenya was “calm and peaceful”. Kenyan opposition leader Raila Odinga has decided to withdraw from October’s election re-run. Raila Odinga said his decision would give the electoral commission enough time to introduce reforms that will help deliver a more credible election. The Supreme Court annulled the result of the original August 8 poll, which saw Uhuru Kenyatta declared winner, after finding irregularities. However, Uhuru Kenyatta says he is ready to proceed with the new vote as planned. Kenya’s electoral commission said Uhuru Kenyatta had won the August vote by a margin of 1.4 million votes – or 54% of the total, compared to Raila Odinga’s 44%. VP William Ruto has now called on the commission to declare Uhuru Kenyatta president as a result of Raila Odinga’s announcement. As a result, Raila Odinga said, “considering the interests of the people of Kenya, the region and the world at large” it was best that he withdrew from the race. His coalition party believes the election will have to be cancelled as a result of his withdrawal, allowing “adequate time to undertake the reforms necessary to conduct an election that is in strict conformity with the constitution, the relevant laws and the constitution”. The result of Kenya’s presidential election has been annulled by the country’s Supreme Court after citing irregularities. The court ordered a new election within 60 days. His opponent, Raila Odinga, said the commission was “rotten” and demanded resignations and prosecutions. President Uhuru Kenyatta said he would respect the court’s decision but also branded the judges “crooks”. Other elections in Africa have been annulled or canceled but this appears to be the first time on the continent that an opposition court challenge against a presidential poll result has been successful. Chief Justice David Maraga said the August 8 election had not been “conducted in accordance with the constitution” and declared it “invalid, null and void”. The court ruling did not attribute any blame to Uhuru Kenyatta’s party or campaign. Justice David Maraga said the election commission had failed “to conduct the presidential election in a manner consistent with the dictates of the constitution”. Raila Odinga, 72, said the ruling marked “a historic day for the people of Kenya and by extension for the people of the continent of Africa”. In a TV address, President Kenyatta said that it was “important to respect the rule of law even if you disagree with the Supreme Court ruling”. He referred to Justice David Maraga and his fellow judges as wakora (crooks in Swahili), saying they had “decided to cancel the election”. He warned the chief justice that as the poll had been annulled he was now the president again, not president-elect. “Do you understand me? Maraga should know that he is now dealing with the serving president,” the president said. After the election, international monitors from the EU, the African Union and the US had said there was no major fraud on polling day and urged Raila Odinga to concede. On September 1, Marietje Schaake, the head of the EU Observer Mission, said the court ruling represented “a historic day for Kenya and we have always said that people who feel aggrieved should seek the path of the courts”. Marietje Schaake said the monitors were awaiting the full details of the ruling. Dozens of people are feared trapped after the collapse of a seven-storey building in heavy rain in the Kenyan capital Nairobi, rescuers say. 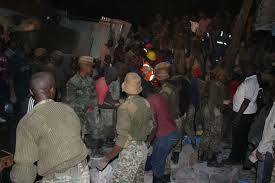 Footages from the scene showed a crowd gathering at the Huruma residential estate as rescuers dug for survivors. At least seven people are known to have died. The Red Cross criticized “chaotic scenes” as rescuers arrived. 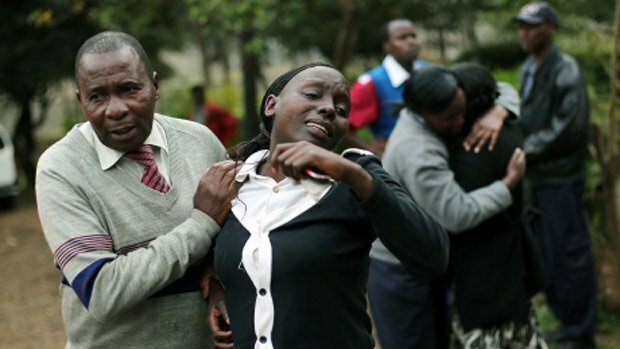 At least 121 people had been rescued, police told Kenya’s KTN network . It is unclear how many people are trapped beneath seven floors of concrete. The rainfall in addition has caused landslides, washed away houses and flooded roads. Fourteen people died in the Nairobi rains, including those in the collapse, police told KTN. Another four died when a wall toppled over, officials said. The Huruma neighborhood is a poor district on the outskirts of Nairobi made up of narrow streets, meaning firefighters struggled to get to the scene and were delayed by large crowds. After some time, the army took charge of the rescue – with the help of the Kenyan Red Cross. Residents said that the building shook violently in the rain before collapsing. There has however been some good news for the rescuers who extracted a number of children from the wreckage. In 2015, President Uhuru Kenyatta ordered an audit of all the buildings in Kenya after a spate of collapses. Pope Francis has celebrated Holy Mass attended by thousands of people at the University of Nairobi campus in Kenya. The Pope made a plea for traditional values, saying “the health of any society depends on the health of its families”. 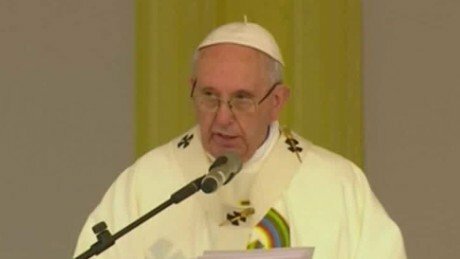 He earlier urged Kenyans to work for peace and reconciliation on his first trip as pontiff to Africa, amid a rise in militant violence. Pope Francis arrived in Kenya on November 25, the first stop on a three-nation tour. Crowds in the Kenyan capital, Nairobi, waited in the rain at the University of Nairobi sports ground since the early hours of November 26. More than one million were expected to attend the Mass. Pope Francis appealed to young Kenyans “to shape a society which is ever more just, inclusive and respectful of human dignity”. He said they “should reject everything that leads to prejudice and discrimination”. Ahead of the Mass, Pope Francis had been meeting with religious leaders, who he said should be “prophets of peace” in a violent and hate-driven world. The Pope earlier said conflict and terrorism fed “on fear, mistrust, and the despair born of poverty and frustration”. Pope Francis has played down security fears about his trip, joking that he was “more worried about the mosquitoes”. A leading Muslim cleric in Kenya welcomed the visit, saying it gave hope to the “downtrodden in the slums”. Pope Francis’s five-day visit will also see him go to Uganda and Central African Republic, which has been hit by Christian-Muslim conflict. Kenya’s government has said that up to 10,000 police officers may be deployed during the visit. Militant Islamists have carried out a series of attacks in Kenya – including the 2013 siege at Nairobi’s Westgate shopping centre, which left 67 people dead and the killing of about 150 people during an assault on the Garissa National University College in April 2015. Pope Francis is later expected to visit the headquarters of the UN Environment Program, and he has already spoken of a “grave environmental crisis” facing the world, and said leaders needed to promote “responsible models of economic development”. Kenyan President Uhuru Kenyatta has called on Pope Francis to pray that Kenya succeeds in its fight against corruption. About 30% of Kenyans – including the president – are baptized Catholics. President Barack Obama will end his Kenya trip with a televised address at Nairobi’s Kasarani stadium. On July 25, President Barack Obama discussed security issues with his Kenyan President Uhuru Kenyatta. Later on Sunday, Barack Obama will fly on to Ethiopia. The Kasarani stadium, where Barack Obama will make his speech, was last year used as a controversial detention camp for hundreds of Somalis during an operation against the Islamist group al-Shabab. Barack Obama is expected to warn that such tactics risk alienating communities and stoking radicalism. On July 25, Barack Obama acknowledged the role the Kenyan government had played in the fight against militant groups such as al-Shabab. Al-Shabab has carried out a deadly campaign in Kenya including the 2013 attack on Nairobi’s Westgate shopping centre and an attack in April in Garissa that killed nearly 150 people. Security has been tight for Barack Obama’s two-day visit to Kenya. The trip, which began on July 24, is his first visit as president to the land where his father was born. In Ethiopia, Barack Obama will be the first US president to visit the country. He will also become the first US leader to address the 54-member African Union (AU) on July 28. AU Commission chief Nkosazana Dlamini-Zuma described Barack Obama’s trip to Ethiopia as a “historic visit” that would “broaden and deepen the relationship between the AU and the US”. On July 25, Barack Obama praised Africa’s economic and business potential in a speech at a business summit. After holding bilateral talks, Barack Obama and Uhuru Kenyatta said they were “united against terrorism”. However, the two leaders differed sharply in their positions on gay rights. While Barack Obama spoke strongly against discrimination, Uhuru Kenyatta said Kenya did not share the same values. 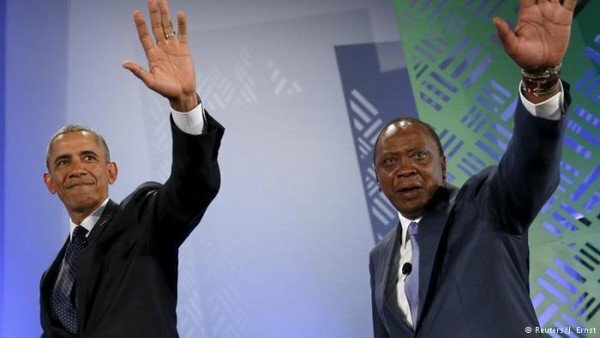 President Barack Obama has urged Kenya to hold “visible” trials to tackle corruption, which he said could be the “biggest impediment” to further growth. After talks in Nairobi, Presidents Barack Obama and Uhuru Kenyatta said they were “united against terrorism” and efforts to deal with it. There were “some things that we must admit we don’t share – our culture, our societies don’t accept,” Uhuru Kenyatta said. Earlier President Barack Obama praised Africa’s economic and business potential in a speech. “Africa is on the move… People are being lifted out of poverty, incomes are up (and) the middle class is growing,” he told a business summit. He also visited a memorial for those killed in the 1998 US embassy bombing. The trip, which began on July 24, is Barack Obama’s first visit as president to Kenya, where his father was born. Barack Obama said he was encouraged by statements President Uhuru Kenyatta had made about the need to root out corruption. People were being “consistently sapped by corruption at a high level and at a low level” and there was a need for “visible prosecutions,” Barack Obama said, to show Kenyans that action was being taken. Police officers and civil servants had to be paid properly to help curb corruption, but sometimes it just required “breaking the habit”. 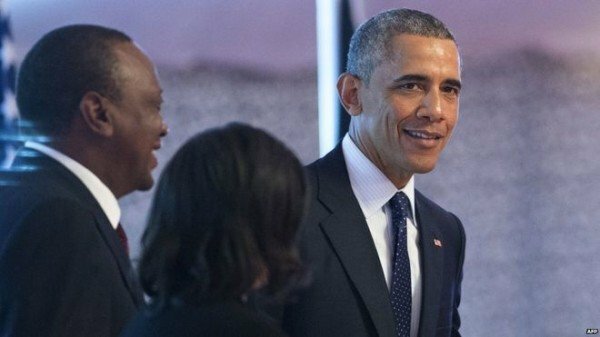 President Barack Obama also said the US is providing additional funding and assistance to Kenya’s security forces for counter-terrorism. 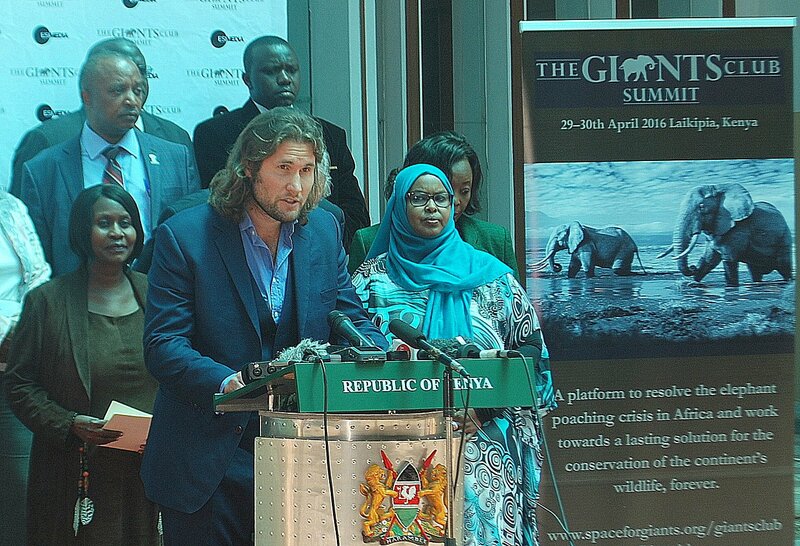 The US and Kenya are working to establish direct flights. 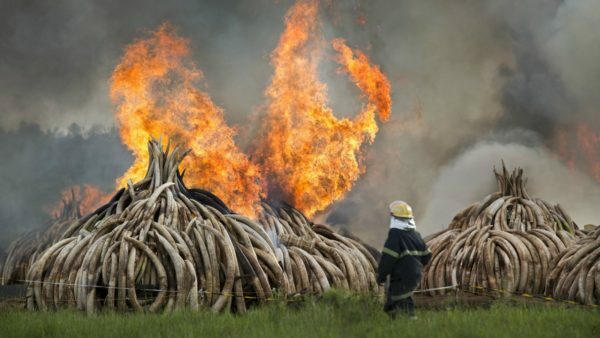 The Obama administration will also propose a federal rule banning the sale of almost all ivory across state lines as part of efforts to fight poaching in Africa. Barack Obama has arrived in Kenya on the first visit to his father’s homeland as serving US president. During his two-day visit President Barack Obama will hold talks with Kenyan President Uhuru Kenyatta and other top officials. The trip to Kenya and then Ethiopia is designed to show US commitment to fighting terror in East Africa. The Air Force One touched down at Nairobi’s international airport shortly before 20:10 local time. Arriving in Kenya, where his father was born, Barack Obama was greeted at the airport by President Uhuru Kenyatta with a handshake and embrace. 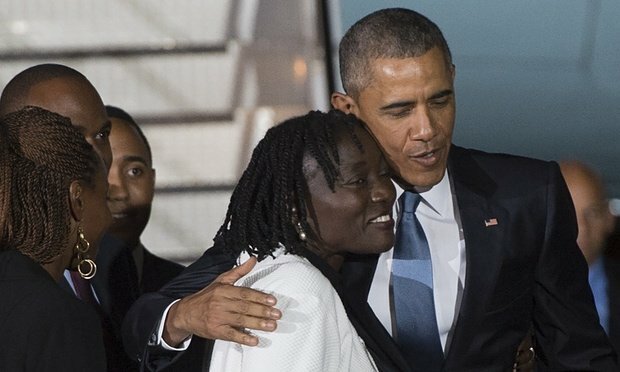 Barack Obama also hugged his half-sister Auma, who then travelled in the presidential limousine to the hotel where the president is staying. Nairobi is in lockdown, many streets are closed and people are opting to stay at home. Barack Obama, the first sitting president to visit Kenya, will hold talks on trade and investment, and also security and counter-terrorism. He also becomes the first US leader to address the African Union when he travels on to Ethiopia on July 26. This is Barack Obama’s fifth trip to Africa as president, but despite his close family links to Kenya, he has faced criticism in some African countries over the legalization of gay marriage in the US. 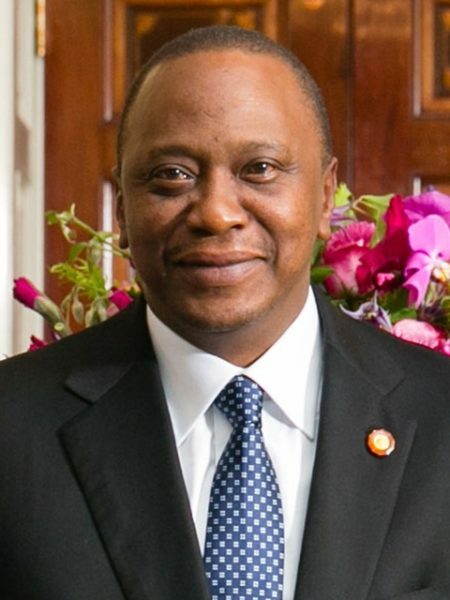 Kenya’s President Uhuru Kenyatta has confirmed during a speech in front of the parliament that he will be appearing at the International Criminal Court (ICC) in The Hague on October 8. Uhuru Kenyatta told parliament that his deputy, William Ruto, would be in charge during his absence. The president faces charges of organizing ethnic massacres that killed 1,200 people after the 2007 elections – something he denies. The October 8 hearing is due to set a date for his trial to begin. The ICC had summoned Uhuru Kenyatta to appear to explain allegations that evidence against him had been withheld. In September, the court postponed the trial after prosecutors said the Kenyan government had failed to deliver key documents. Witnesses for the prosecution have withdrawn from the case. 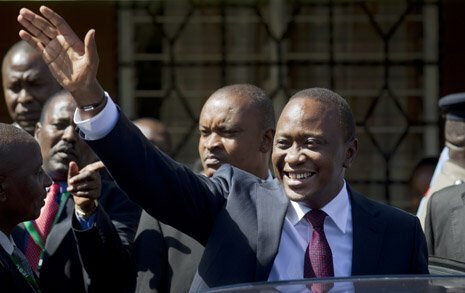 Dozens of Kenyan lawmakers are expected to travel to The Hague to back Uhuru Kenyatta at the status hearing. Uhuru Kenyatta said he would be going to The Hague in a personal capacity – not as president – so as not to compromise the sovereignty of Kenya’s 40 million people. 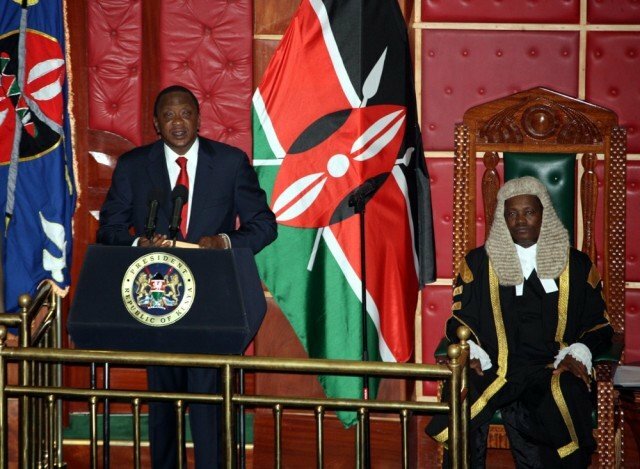 “To protect the sovereignty of the Kenyan republic, I now take the extraordinary and unprecedented step of evoking article 1473 of the constitution and I will shortly issue the legal notice necessary to appoint honourable William Ruto, the deputy president, as acting president while I attend the status conference at The Hague in the Netherlands,” he said. Uhuru Kenyatta again stressed his innocence: “I wish to reiterate here for all that my conscience is clear, has been clear and will remain forever clear that I am innocent of all the accusations that have been leveled against me. There had been growing doubts as to whether Uhuru Kenyatta would become the first sitting president to attend the court. He had already been to the ICC before becoming president in 2013. Uhuru Kenyatta was a close ally of President Mwai Kibaki, who was declared the winner of the 2007 election. Mwai Kibaki’s rival, Raila Odinga, claimed the poll was marred by fraud. The dispute took on an ethnic dimension, pitting members of the Kikuyu ethnic group of Uhuru Kenyatta and Mwai Kibaki against other communities. Uhuru Kenyatta is accused of organising an ethnic Kikuyu gang, the Mungiki sect, to attack rival groups. Uhuru Kenyatta faces five charges relating to the ethnic massacres – the worst violence in Kenya since independence in 1963. Tens of thousands of people were displaced and Kenya’s reputation for stability was tarnished. Vice-President WSilliam Ruto also faces charges at The Hague, but he was on Raila Odinga’s side during the violence. He also denies the charges. 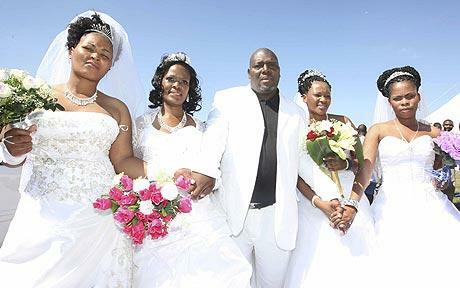 President Uhuru Kenyatta has signed into law a bill legalizing polygamy in Kenya. The new bill brings civil law, where a man was only allowed one wife, into line with customary law, where some cultures allow multiple partners. Controversy surrounded an amendment to the bill, supported by many male lawmakers, allowing men to take more wives without consulting existing spouses. Traditionally, first wives are supposed to give prior approval. Last month, female lawmakers walked out of parliament in disgust after their male counterparts voted through the amendment. They argued that a decision to take on another wife would affect the whole family, including the financial position of other spouses. The bill was also opposed by Christian leaders who urged the president not to sign it into law, saying it undermined Christian principles of marriage and family. “The tone of that bill, if it becomes law, would be demeaning to women since it does not respect the principle of equality of spouses in the institution of marriage,” Archbishop Timothy Ndambuki, from the National Council of Churches of Kenya (NCCK), was quoted by Kenya’s Standard newspaper as saying. The marriage legislation has been under discussion for several years and some initial proposals were scrapped at committee stages. It has abolished the practice of unofficial traditional marriages which were never registered and could be ended without any legal divorce proceedings. But plans to ban the payment of bride prices were dropped – although a person must be 18 to marry and this now applies to all cultures. Lawmakers did reject the committee amendment which said a woman should only be entitled to 30% of matrimonial property after death or divorce. The law now allows for equal property and inheritance rights – previously a woman had to prove her contribution to the couple’s wealth. It also stipulates that a wife is entitled to an equal share of whatever the couple acquired during their marriage but in the case of multiple partners it is going to be difficult to determine what each spouse is entitled to if one of them divorces or their husband dies. There had also been a proposal to recognize co-habiting couples, known in Kenya as “come-we-stay” relationships, after six months, but this too was dropped. It would have allowed a woman to seek maintenance for herself and any children of the union, had the man left. 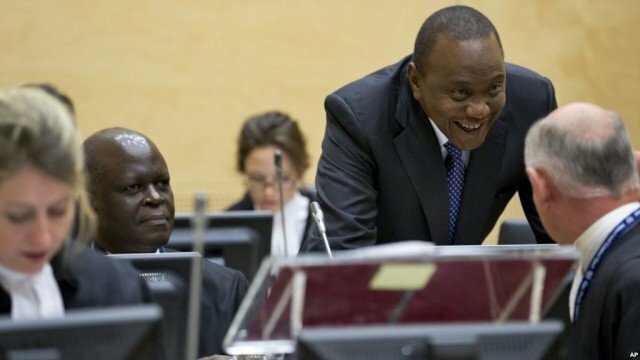 A deferral of The Hague trial of Kenyan President Uhuru Kenyatta – due to start in November – has been demanded at the African Union summit in Ethiopia. The AU also agreed a resolution stating no sitting African head of state should appear before an international court. With both Kenyan and Sudanese presidents facing ICC cases, African leaders have long complained that the court unfairly targets them. The AU had discussed withdrawing from the ICC, but failed to get support. Senior figures including Kofi Annan have criticized plans to quit the ICC. The AU leaders, meeting in Addis Ababa, agreed to back immunity for any sitting African head of state. They also asked Kenya to write to the UN Security Council seeking a deferral in the International Criminal Court (ICC) case against Kenyan President Uhuru Kenyatta, who faces charges of crimes against humanity. Both he and his deputy, William Ruto, deny charges of organizing violence after the 2007 election. While William Ruto went on trial in September, President Kenyatta has repeatedly requested his trial – due next month – be postponed. Addressing the summit, Uhuru Kenyatta accused the court of bias and “race-hunting”, AFP reports. Ethiopian PM and AU chairman Hailemariam Dessalegn said the summit was not a crusade against the ICC but a call for the court to address Africa’s concerns seriously. He said the ICC’s cases against the Sudanese and Kenyan presidents could hamper peace and reconciliation efforts in their countries. “The unfair treatment that we have been subjected to by the ICC is completely unacceptable,” he said. The ICC issued a warrant in 2009 for Sudanese President Omar al-Bashir over alleged war crimes in the Darfur region, but he has not yet been arrested. The ICC relies on the authorities of national governments to hand over suspects, but Mr Bashir has avoided arrest despite travelling to countries that have signed up to the ICC statute. Ethiopian Foreign Minister Tedros Adhanom Ghebreyesus, who is the current chairman of the AU’s Executive Council, said the ICC had failed to respond to the African Union’s previous complaints. “What the summit decided is that President Kenyatta should not appear until the request we have made is actually answered,” he said. Thirty-four of the AU’s 54 members have signed up to the ICC. 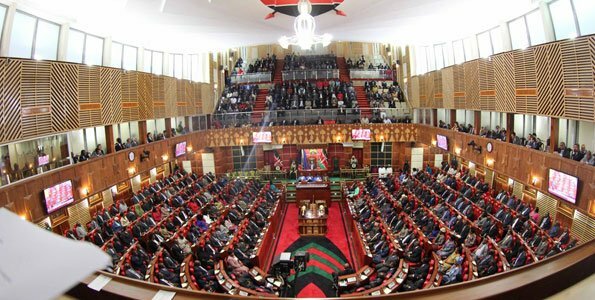 Kenya’s parliament has already passed a motion for the country to withdraw. Former UN Secretary-General Kofi Annan has said that withdrawing from the court would be a “badge of shame”. Nobel Peace laureate Archbishop Desmond Tutu has also voiced his support for the ICC. “Those leaders seeking to skirt the court are effectively looking for a license to kill, maim and oppress their own people without consequence,” he wrote in an article carried by several newspapers. Kenya’s President Uhuru Kenyatta has announced that the four-day siege involving suspected Islamist militants at Nairobi’s Westgate shopping centre is over. Five attackers were shot dead by troops and 11 suspects were in custody, he said in a TV address to the nation. Kenya has “shamed and defeated our attackers” but the “losses are immense”, Uhuru Kenyatta said, confirming that 61 civilians and six soldiers had died. Three days of national mourning have been declared, starting on Wednesday. Uhuru Kenyatta said that several bodies – including those of “terrorists” – were thought to be trapped under rubble after three floors of the building collapsed following a blaze on Monday. Some 175 people were injured in the attack; 62 people remain in hospital and many others are being treated for shock and are undergoing counseling. “I promise that we shall have a full accountability for the mindless destruction, deaths, pain, loss and suffering we have all undergone as a national family. “These cowards will meet justice, as will their accomplices and patrons, wherever they are,” he said. At least 18 foreigners are among the dead, citizens from France, UK, Canada, the Netherlands, Australia, Peru, India, Ghana, South Africa and China. The militants stormed the Westgate centre on Saturday, throwing grenades and firing on shoppers and staff. Uhuru Kenyatta said he could not confirm reports that a British national and two or three US citizens were involved in the attacks, but he said forensic experts were carrying out tests to ascertain their nationalities. In an interview with the US TV programme PBS Newshour, Kenya’s Foreign Minister Amina Mohamed said the Americans were 18 or 19 years old, of Somali or Arab origin. Her remarks have fuelled media speculation about the possible involvement of Samantha Lewthwaite, the widow of one of the men who carried out attacks on London’s transport system on July 7th, 2005. However, a Twitter post from al-Shabab on Tuesday evening dismissed claims that women were involved in the attack. The group said it “categorically” denied involvement of any woman”. An unknown number of hostages are still inside Westgate shopping centre in Nairobi, Kenya, after a deadly assault by al-Shabab militants, officials say. At least 39 people died when members of the Somali Islamist group stormed the Westgate centre on Saturday. Officials say the gunmen have been cornered but that people are trapped in a number of locations. Kenyan President Uhuru Kenyatta earlier vowed to “hunt down the perpetrators wherever they run to”. Al-Shabab said it carried out the attack on the upmarket mall in response to Kenyan military operations in Somalia. 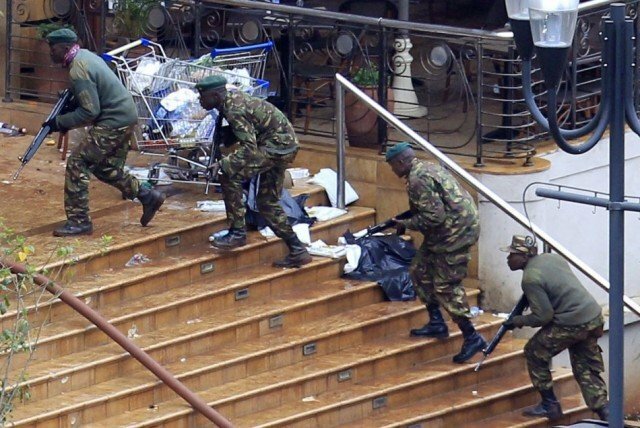 On its Twitter feed, al-Shabab – which has links to al-Qaeda – said it was behind what it called the “Westgate spectacle”. Kenyan officials said “major operations” were under way with police and soldiers preparing an apparent bid to bring an end to the stand-off. They said the security forces had finally “pinned down” the surviving gunmen. “The work is continuing, but you cannot rush these things,” an army officer posted on the perimeter cordon set up around the mall told the AFP news agency. The authorities have asked journalists to exercise caution when reporting military developments because the gunmen might be monitoring the media. “Hostiles suspected to have access to the internet,” the Disaster Operation Centre in Nairobi posted on Twitter. The officials said the number of hostages was “still unknown, but they are in several locations”. Upper levels of the mall had been secured, it said. The attack began at about 12:00 local time, when the attackers entered the Westgate centre throwing grenades and firing automatic weapons. A children’s day event was being held at the time – children are among those reported killed. Some witnesses said the militants told Muslims to leave and said non-Muslims would be targeted. “They came and said: <<If you are Muslim, stand up. We’ve come to rescue you>>,” said Elijah Lamau. He said the Muslims left with their hands up, and then the gunmen shot two people. Scores of people fled or were evacuated while police and armed security guards fought running gun battles with the militants throughout the mall for hours. As night fell in Nairobi, two contingents of army special forces troops were reported to have moved inside the mall. Reports say at least one of the attackers was a woman who appeared to have some kind of leadership role. One gunman was arrested and died of his wounds, Kenyan officials said. Four other gunmen were arrested. In a televised address on Saturday evening, President Uhuru Kenyatta said security forces were “in the process of neutralizing the attackers and securing the mall”. He said he had “personally lost family members in the Westgate attack”. Security experts are reported to have long warned that the complex, which is part Israeli-owned, was in danger of being subjected to a terror attack. Al-Shabab says the African Union forces are invaders stopping their legitimate vision of creating an Islamic state and respond by mounting hit-and-run attacks. The US State Department said it had reports that American citizens were injured in what it called “a senseless act of violence”. Two French citizens and two Canadians, including a diplomat, are also among the dead. Nairobi’s mortuary superintendent, Sammy Nyongesa Jacob, told Reuters that Africans, Asians and Caucasians were among the bodies brought to the mortuary. This is one of the worst incidents in Kenya since the attack on the US embassy in August 1998. Uhuru Kenyatta has been sworn in as Kenya’s president after winning elections against Raila Odinga back in March. Dignitaries and tens of thousands of people witnessed the inauguration at a stadium in the capital, Nairobi. Raila Odinga did not attend the ceremony after his attempt to overturn Uhuru Kenyatta’s victory in court failed. Uhuru Kenyatta and his deputy, William Ruto, face charges at the International Criminal Court relating to post-election violence five years ago. They were on opposite sides at the time and both deny the accusations. Sudanese President Omar al-Bashir, who faces an ICC arrest warrant over the conflict in Darfur, was not in Nairobi for the inauguration. Uhuru Kenyatta, 51, is the son of Kenya’s founding father, Jomo Kenyatta, and is heir to one of the largest fortunes in Kenya. The crowd, waving Kenyan flags, burst into rapturous welcome as Uhuru Kenyatta took the oath of office, becoming Kenya’s youngest president. 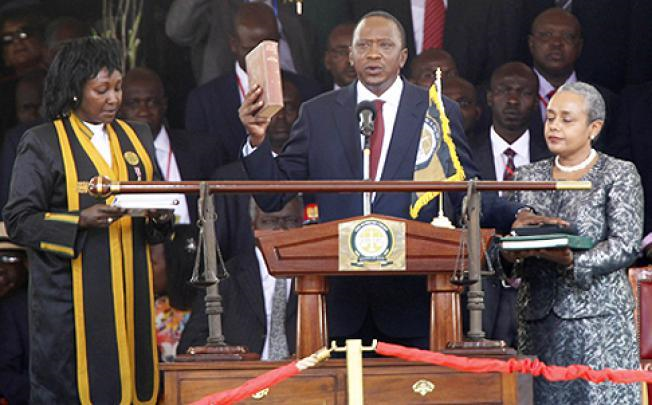 In his inaugural address, Uhuru Kenyatta said he would govern for all Kenyans. “We will leave no community behind… Where there’s disillusionment, we’ll restore hope,” he said. The new government would abolish maternity fees in its first 100 days and children starting school next year would be given laptops, he added. US and European diplomats attended the inauguration, despite warning before the election that they would have limited contact with Uhuru Kenyatta if he is voted into office. Among the African leaders present for the inauguration were South Africa’s Jacob Zuma, Nigeria’s Goodluck Jonathan and Uganda’s Yoweri Museveni. Yoweri Museveni told the cheering crowd that he wanted to applaud Kenyans for rejecting the “blackmail” of the ICC. He supported the ICC when it was formed, but it was now being used by “arrogant actors” who were trying to “install leaders of their choice in Africa and eliminate those they don’t like”, he said. Raila Odinga – the outgoing prime minister – did not attend the ceremony, choosing to be on holiday in South Africa instead. Other senior members of his Coalition for Reforms and Democracy (CORD) party have also stayed away to signal their opposition to Uhuru Kenyatta’s presidency, correspondents say. According to official results, Uhuru Kenyatta beat Raila Odinga by 50.07% to 43.28% in March, avoiding a run-off by just 8,100 votes. Raila Odinga challenged the result, but said he would respect the Kenyan Supreme Court’s ruling in Uhuru Kenyatta’s favor. The election was Kenya’s first after a disputed poll in 2007, which led to violence that left more than 1,200 people dead. Uhuru Kenyatta is due to appear at the ICC for his trial in The Hague later this year, accused of crimes against humanity. He denies the charges. Kenya is a party to the Rome Statute, the treaty which established the ICC in 2002. But like most African countries, it has refused to enforce the ICC warrant for Omar al-Bashir’s arrest. After Omar al-Bashir visited Kenya in 2010, a Kenyan court ruled that the government must arrest him if he returned, in line with its international obligations under the Rome Statute. The government is appealing against the ruling. Uhuru Kenyatta has fairly won the country’s presidential election, Kenya’s Supreme Court has ruled today rejecting several petitions challenging the vote. Chief Justice Willy Mutunga announced the decision, saying the poll was free and fair. The appeal was lodged by PM Raila Odinga, Uhuru Kenyatta’s main rival in the presidential poll this month. Official results said Uhuru Kenyatta beat Raila Odinga by 50.07% to 43.28%, avoiding a run-off by just 8,100 votes. There is tight security at the Supreme Court. Violence after a disputed election in 2007 left more than 1,200 people dead. The presidential, legislative and municipal elections held on March 4 were the first since the 2007 poll. Uhuru Kenyatta and his running mate, William Ruto, are facing trial on charges of crimes against humanity at the International Criminal Court (ICC) for allegedly fuelling unrest after that election. They deny the charges. There was tight security for the court decision, with all roads leading to the building closed. Police chief David Kimaiyo warned on Friday that unrest would not be tolerated. He said: “We have reports indicating that some parties have organized their supporters to converge outside the Supreme Court during delivery of the ruling, and we will not allow any such gatherings. Outgoing President Mwai Kibaki has urged people to stay calm and accept the result, but much will depend on Kenyans’ faith in their newly reformed judiciary. Lawyers for Raila Odinga said their petition to the Supreme Court included allegations of vote manipulation, as well as problems with the registration of voters and an electronic vote counting mechanism. On Friday, the Supreme Court reviewed recounts from 22 polling stations. Both sides claimed that the recounts vindicated their position. Uhuru Kenyatta has called the election, which was largely conducted peacefully, a “triumph of democracy”. The Independent Electoral and Boundaries Commission (IEBC) has insisted that the vote was credible, despite technical failures with an electronic voter ID system and the vote counting mechanism. International observers said the poll was largely free, fair and credible, and that the electoral commission had conducted its business in an open and transparent manner. Kenya’s PM Raila Odinga has filed a Supreme Court appeal against Uhuru Kenyatta’s narrow victory in the recent presidential election’s first round. Uhuru Kenyatta beat Raila Odinga comfortably by 50.7% to 43.28% on March 4, avoiding a run-off by only 8,100 votes. 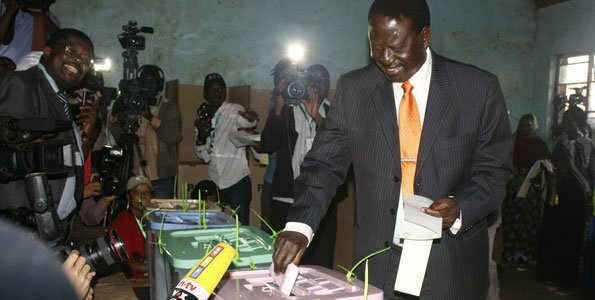 However, Raila Odinga has accused the electoral authorities of manipulating the result. Police fired tear gas to disperse about 100 supporters of his Coalition for Reforms and Democracy (Cord) who had gathered outside the Supreme Court. The police had warned them that they would not be allowed to do so. Some of the crowd were wearing t-shirts bearing slogans including “I support the petition” and “Democracy on trial”. The presidential, legislative and municipal elections held 12 days ago were the first since the 2007 poll which set off ethnic and political violence in which more than 1,200 people were killed. Uhuru Kenyatta and his running mate, William Ruto, are facing trial on charges of crimes against humanity at the International Criminal Court (ICC) for allegedly fuelling the unrest. They deny the charges. “I have no hesitation whatsoever in lawfully challenging the election outcome,” Raila Odinga told reporters outside his offices in Nairobi. “These failures dwarf anything Kenyans have ever witnessed in any previous election,” the prime minister added. However, Raila Odinga urged his supporters not to resort to violence.“We cannot begin what is supposed to be a new era under a new constitution in the same old ways,” he added, referring to the charter adopted in 2010. The Minister of Lands, James Orengo, a senior Cord official, said the party had a constitutional right to file the petition and a “strong case”. “Expect a new election, and this time around no monkey-business. I think we’re going to win and win in the first round,” James Orengo told KTN TV. “I can assure you that we have the evidence, and we have the will and the preparedness to prosecute the petition,” he added. James Orengo nevertheless promised that Cord would respect the Supreme Court’s ruling if it went against the party, and urged Uhuru Kenyatta and his supporters to declare that they would do likewise. In his acceptance speech last Saturday, Uhuru Kenyatta described the election as “free and fair” and a “triumph of democracy”. The Independent Electoral and Boundaries Commission (IEBC) has also insisted that the vote was credible and that it is ready for any legal scrutiny. International observers said the election was largely free, fair and credible, and that the electoral commission had conducted its business in an open and transparent manner. Raila Odinga was the runner-up to Mwai Kibaki in the 2007 presidential election, which he also said was stolen. Kenyan Deputy PM Uhuru Kenyatta appears to have won the presidential election by the tightest of margins as the provisional results indicate. After all the votes were counted Uhuru Kenyatta had polled 50.03% of the vote, 4,109 votes over the threshold required for outright victory. However, the official result is not expected before 11:00 on Saturday. Rival candidate Raila Odinga is set to file a legal challenge if he loses. One of Raila Odinga’s aides said the candidate had “no intention” of conceding defeat. Both candidates have complained of irregularities during the course of the count, since Monday’s election. Uhuru Kenyatta won 6,173,433 votes out of a total of 12,338,667, well ahead of the prime minister, who polled 5,340,546 – or 43.28% of the vote. Uhuru Kenyatta’s Jubilee Coalition party said it was “proud and honored for the trust” bestowed on it, adding that it had taken a message to the people and that “we are grateful to the people of Kenya for accepting this message”. Early on Saturday, small groups of Kenyatta supporters celebrated in Nairobi, hooting car horns and singing. If Uhuru Kenyatta is confirmed by Kenya’s Independent Electoral and Boundaries Commission (IEBC), he could face difficult relations with Western countries. He faces trial at the International Criminal Court (ICC) in The Hague in July for crimes against humanity. He is accused of fuelling communal violence after the 2007 election that saw more than 1,000 people killed and 600,000 forced from their homes. Uhuru Kenyatta’s running mate, William Ruto, also faces similar charges. Both men deny the accusations. The ICC has agreed to postpone William Ruto’s trial by a month until May after his lawyers complained of not having enough time to prepare his defence. Countries including the US and UK have hinted that his election as president would have consequences for their relations with the Nairobi government – comments which have been dismissed in Nairobi as unwanted foreign interference in domestic matters. Kenya’s new electronic voting system was designed to eliminate the chance of vote-rigging and with it any risk of a repeat of the post-poll violence of 2007. But the count has been plagued with technical glitches, including a programming error that led to the number of rejected votes being multiplied by a factor of eight. By Wednesday, the electronic system was abandoned and the count restarted by hand. According to Kenya’s election rules, the winner needs to poll more than 50% of the vote to avoid a second round run-off next month. If the election commission confirms that Uhuru Kenyatta has crossed the 50% threshold by such a narrow margin, then Raila Odinga’s officials say he will challenge the outcome. 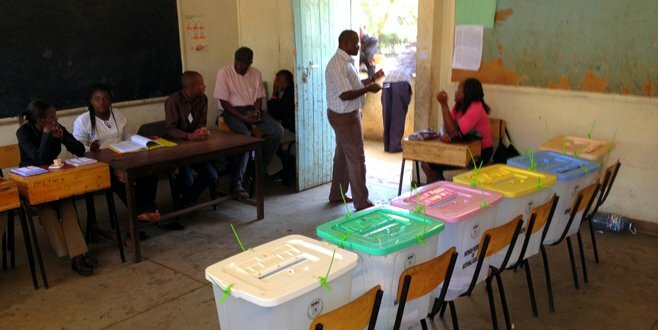 The prime minister’s Cord alliance had earlier complained that votes from 11 constituencies were missing, in effect leaving him more than 250,000 votes short. Both men passed a second condition needed for victory – at least 25% of the vote in more than half of the 47 counties. Kenya is voting in an election that observers describe as the most important in the country’s history. It is the first time a vote has taken place under Kenyan new constitution, designed to prevent a repeat of violence that followed the 2007 polls. More than 1,000 people died in widespread ethnic violence when supporters of rival candidates clashed. Despite appeals for calm, at least four police officers died when they were attacked near Mombasa on Monday. At least six other people – including several attackers – are also reported to have died in the assault in the early hours in Changamwe, half an hour’s drive from the centre of Mombasa. Reports from around the country suggested long lines of voters were forming before polling stations opened. Some technical difficulties were reported with newly instituted biometric voting kits – designed to counter claims of vote-rigging and long delays in announcing poll results that were partly blamed for the violence last time. Eight presidential candidates are standing but it is essentially a two-horse race pitting Prime Minister Raila Odinga against Deputy Prime Minister Uhuru Kenyatta. Some observers say they are particularly concerned about violence erupting should neither of the two frontrunners poll more than 50% – in which case the vote will go to a run-off, probably on April 11. Uhuru Kenyatta, son of Kenya’s founding father Jomo Kenyatta, is due to stand trial at the International Criminal Court for his alleged role in orchestrating the violence five years ago. His running mate, William Ruto, has also been indicted by the court. Both men deny any wrongdoing. The post-election violence of 2007-8 broke out after Raila Odinga claimed he had been cheated of victory by supporters of President Mwai Kibaki. Supporters of the rival candidates, from different ethnic groups, took up arms against each other. Raila Odinga later joined a government of national unity under a peace deal. In the run-up to Monday’s vote, President Mwai Kibaki – who is not seeking re-election – urged Kenyans to vote peacefully and for the losers to accept defeat. “Cast your vote and keep the peace,” he said in a televised address to the nation on Friday. Candidates have also promised to respect the result and urged their supporters to refrain from violence. Clerics across Kenya also gave sermons dedicated to peace on Sunday. The police, however, have warned of conspiracies to cause chaos – in Nairobi and elsewhere – and have made it clear that violence will not be tolerated. 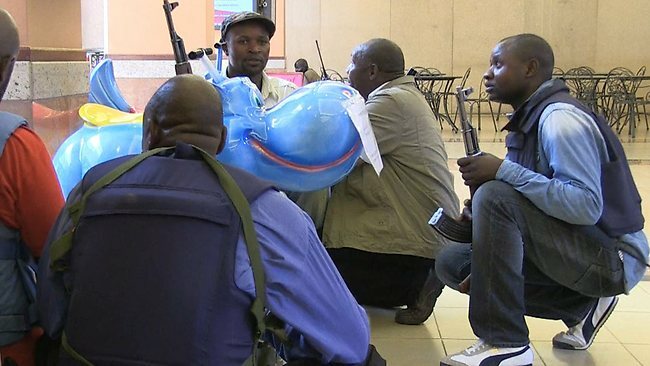 Security is being stepped up with some 99,000 police officers being deployed around the country, at polling stations and vote-counting centres. The polling stations are open from 06:00 to 17:00 local time. Official results will be announced by March 11 by the electoral commission.